Explore the pretty cobbled streets, plazas, promenades and palaces of the exquisite Old Town, or walk along the ancient city walls and admire the views over the town and out to the azure Adriatic beyond. You can also take a daytrip across to the unspoilt islands which lie invitingly off the coast, or just spend an afternoon sunbathing on the city beach. 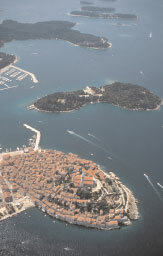 Dalmatia’s ‘capital’ is a lively destination throughout the year and is well served by budget airlines from the UK. Its palm tree-lined Riva, with its many cafes and bars is a great place to sit and people-watch. The town centre itself is built around the original structures of Diocletian’s Roman Palace and today they conceal a rich variety of boutiques, café-bars and restaurants. Football fans may wish to take in a game at the stadium of local favourites Hajduk Split – although their supports are a fanatical bunch and the local ‘derby’ against Dinamo Zagreb would not be for the faint hearted! This little gem of a town graces the Istrian peninsula with its narrow cobbled streets, artists’ studios and waterfront cafes and restaurants. Easily combined with a trip to the Roman ampitheatre at Pula, or even a visit across the Adriatic to Venice, this is a great place to sample the region’s gastronomic delights. Halfway between Split and Zadar, and easily reached from the airports of either, Sibenik claims to be one of Croatia’s oldest towns. Today the historic Cathedral of Saint James’ blend of renaissance and gothic architecture earns it a place on the UNESCO World Heritage site list. Sibenik is also an excellent base from which to visit the spectacular lakes and waterfalls of the nearby Krka National Park – guided excursions can be taken from the town.